Padraig O’Reilly balances a full-time job with numerous positions of responsibility in the Irish Red Cross while he is also a retained firefighter. 12-year-old Sarah McConnellogue has led the charge in recruiting youth members in her local Branch in Muff, Co Donegal. At an exciting ceremony this afternoon, in the home of big wins – Croke Park – Padraig O’Reilly and 12-year-old Sarah McConnellogue were both presented with awards for their dedication to volunteering in their local communities, by the chairman of the Oireachtas Committee on Children and Youth Affairs, Alan Farrell TD. 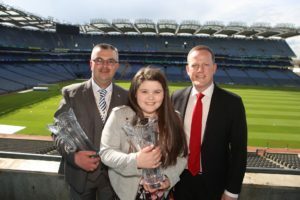 Padraig O’Reilly from Clonakilty, Co Cork was named Volunteer of the Year at the Irish Red Cross National Volunteer of the Year Awards 2018 which took place at Croke Park this afternoon while 12-year-old Sarah McConnellogue from Muff in Co Donegal was named Young Volunteer of the Year. They were presented with their awards by chairman of the Oireachtas Committee on Children and Youth Affairs, Alan Farrell TD. A volunteer with the Irish Red Cross for just shy of 20 years, Padraig O’Reilly balances a hectic schedule; he works full-time in Dunnes Stores, he is a retained firefighter with Cork County Fire Service and he holds no less than three positions in the Irish Red Cross – Branch Secretary, Branch Youth Officer and he is also a training officer in the unit structure. Under his leadership, Clonakilty Red Cross Branch opened their new branch premises in 2016, while Padraig was also the driving force behind getting the Advent Food Collection in aid of Cork Penny Dinners off the ground, with this year’s collection gathering no less than 42 crates of food and 12 bags of toiletries. But Padraig’s most selfless act of all may have been when Cork was hit by flash floods very early one morning in June 2012. Padraig’s car was damaged by the water but instead of tending to his own needs, he turned his attention to his community and to those whose homes and businesses were damaged. Padraig said at the time his car was the least of his worries as one day it could be replaced. As if this wasn’t enough, Padraig and his wife Aga established the Clonakilty Branch’s Irish Red Cross Chloe Burke Carer of the Year Award, ensuring the memories of their dear colleague Chloe will be remembered for many years to come. Most recently, Padraig gave great service during Storm Emma as he took on treacherous conditions in Clonakilty Branch’s 4×4 ambulance, transporting nurses to work and patients to hospital. 12-year-old Sarah McConnellogue has been a member of the Muff Branch in Donegal for three years. She has completed numerous programmes, including first aid training, and she competes in all Branch first aid training and competitions. Sarah has an impeccable attendance record at the Branch and has not missed a training night in the last two years. She is always first to volunteer when the Branch is helping out at community events and is the first name on the list to attend all youth events. However, Sarah’s greatest talent may be her role as a recruitment aficionado; Muff Branch currently has 19 youth members who are in Sarah’s school class! Sarah is described by those who nominated her as “an enthusiastic, committed volunteer who shows a willingness to learn and develop new skills – she and is a true humanitarian.” It was also noted by her nominators that Sarah has a smile for everyone she meets and befriends new members, ensuring everyone is involved and happy. Sarah is eagerly looking forward to progressing as a member and delivering first aid training, as well as becoming a youth leader. The Irish Red Cross National Volunteer Award kicks off celebrations for World Red Cross Red Crescent Day which is held each year on 8 May to celebrate the work of the Red Cross and Red Crescent globally and locally. The annual Irish Red Cross National Volunteer Awards shine a light on the work of Irish Red Cross volunteers around the country by celebrating their contribution to society. There are nine categories of award, reflecting the variety of humanitarian services fulfilled by Irish Red Cross volunteers, including a Youth Achievement Award and Health and Social Care Award. The Irish Red Cross builds safer and stronger communities through a diverse and innovative range of services tailored to local needs. From patient transfers to community health to first aid training, working with migrants and emergency response, the Irish Red Cross provides these services through the dedication its volunteers. The Irish Red Cross National Volunteer Award kicks off celebrations for World Red Cross Red Crescent Day 2018 which is celebrated every 8 May – the birthdate of the International Red Cross and Red Crescent Movement’s founder Henry Dunant. This is a day when the Movement comes together to thank its volunteers who give their time and their expertise here in Ireland and all over the world. Every year, around the world, the Movement supports many millions of people affected by conflict, natural disasters and other emergencies, through its network of around 14 million volunteers and 450,000 staff.